A very private three-bedroom house with spacious pergolas and terraced gardens surrounding a large pool located amongst mature almond, carob, olive and orange groves. 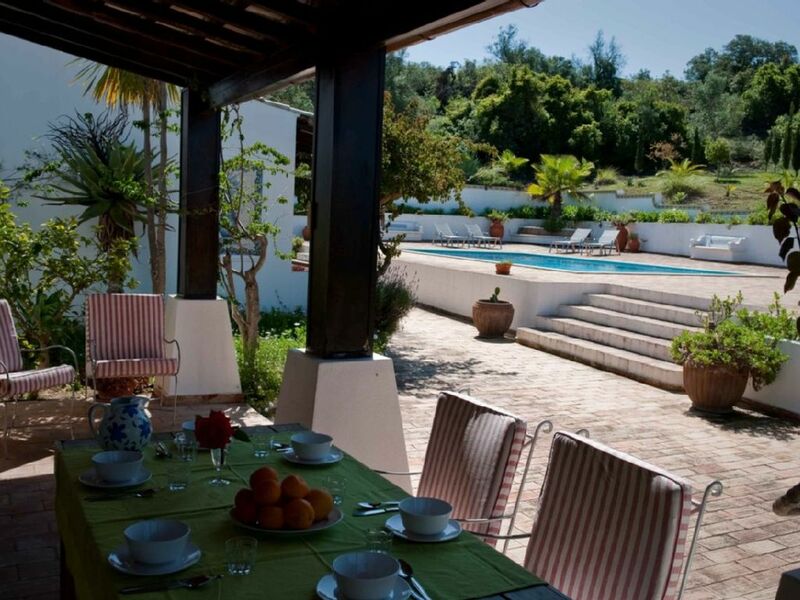 Overlooking traditional countryside of low hills, orchards and nearby a selection of beautiful beaches. A private, quiet and welcoming environment, perfect for couples or families. The garden around the house and the pathways are fully lit. Casa Alexandra has a welcoming and generous living space with comfortable settees beside the open fireplace. The television has freeview UK satelite channels and a DVD player. A large dining table with seating for six, sits between the two French windows that lead out onto the covered patios and large pool terrace. There is a dining table and sixchairs for exterior dining. Leading off the lounge area is the fully fitted kitchen, which has access to the garden at the front of the house and steps down to the parking courtyard. Two twin bedrooms, a large family bathroom and one master en- suite bedroom are reached from the hallway and have access through French windows to their own terraces. All bedrooms have fitted wardrobes. Apart from one small step in the lounge , the villa is all on one level. Casa Alexandra keeps very cool in the summer, with ceramic floor tiles throughout. Casa Alexandra also has wireless internet access. Quality sun loungers deck the terrace around the pool and there are sun umbrellas, tables and chairs available. A baby cot, linen and high chair are also available. The beautiful swimming pool measures 10 m x 6 m with steps leading into a shallow end of 1.2 m and a deep end of 2 m. Freshwater pool with Chlorine cleaning system. The pool is serviced twice weekly during summer and once weekly during the rest of the year by a competent and reliable professional. Pool and garden lighting is available. Casa Alexandra is totally private and not overlooked (or overheard!) in any way. Follow the cobbled pathway in the garden up to a private pergola with stunning sunset views! The nearest houses are approximately 400 metres away down the track, Casa Alexandra is the penultimate property about 1km down a quiet country lane that has no throughway, accessed from a small B road that leads straight into Moncarapacho. There is a blissful sense of total tranquility and quiet in and around this accommodation. The mini supermarket, cafes and restaurants of Moncarapacho can be reached in 5 minutes by car, walked in approximately 35 minutes. The closest selection of beaches being Fuzeta Island, Barril beach and the islands off Olhão, namely Culatra and Armona. There are excellent golf courses within 15 to 20 minutes drive from the accommodation, namely Benamor, Quinta da Ria and Quinta da Cima, Monte Rei. A car is recommended for this property, especially in the heat of summer…and for reaching all the beautiful and interesting places further afield. Car rental, taxi transfers and bicycle hire can be organized with local reputable firms in advance or by calling the local representative. One large bathroom outside twin bedrooms and one en suite bathroom with master bedroom. There is a cloakroom in the hallway. Gas central heating available in the winter, at extra cost. 10 m x 6 m with steps leading into a shallow end of 1.2 m and a deep end of 2 m. Freshwater pool with Chlorine cleaning system. Directions to property not entirely clear, led to false hunt up wrong lane. Correct lane still a challenge, dirt track with rocks that split a car tyre costing over 300 Euro to replace. Property itself was a joy, very much enjoyed by young and old. Main complaint was the beds: hard and unforgiving with pathetic pillows - a common feature of villas in this area in our experience. Also the wifi service provided proved useless. Could connect to service but could not access even an email. Many thanks for your very helpful feedback. We will review and make any necessary corrections to our driving instructions in order to facilitate an easier arrival. All the mattresses at the villa are recently purchased, we will purchase new pillows throughout. We are on call 24 hrs a day, we would have been very happy to supply these and help with any issues whilst you were in residence. Wi- fi services are always being improved, we will suggest an upgrade to the owner of Casa Alexandra. We are happy that you enjoyed the majority of your stay and look forward to welcoming you back to the Algarve in the near future. We loved Casa Alexandra, especially the outdoor areas. We spent over 3 weeks during October and the weather was fantastic apart from a few days of rain. The views from the pagoda are sensational, especially at sunset and the pool terrace and surroundings are spacious. We loved having barbeques by the pool and picking our own oranges and lemons from the trees. Moncarapacho and Fuzeta are very close and have a nice authentic feel to them. The beaches are beautiful and we loved how unspoilt they are. Vielen dank für Ihre schöne Feedback! Ihr seit jeder Zeit wieder Wilkommen! Entourée de champs d’oliviers et d’orangers, cette location est idéale si vous cherchez la tranquillité et l’isolement, sans aucun vis-à-vis. Le village de Moncarapacho n’est qu’à 6 min en voiture, et son petit supermarché est très correct. Nous avons adoré notre séjour, loin de la foule de vacanciers qui s’agglutine plus à l’ouest, dans la région de Portimao. La maison est belle et confortable, d’une propreté irréprochable. La cuisine est bien équipée, la salle de bain principale est immense. Les chambres sont grandes et possèdent des armoires encastrées et une commode, donc beaucoup de rangement. Le jardin est très fleuri et bien entretenu, et la piscine est très grande, avec un côté bien profond et un accès facile grâce à des marches. Attention toutefois, pas de protection ou alarme pour enfants en bas-âge. Il n’y a pas la climatisation, mais un ventilateur sur pied dans chaque chambre permet de supporter les nuits les plus torrides ! L’agence a été parfaite, et notre contact sur place (Lin) était adorable et très serviable. Bref, nous recommandons sans hésiter ! Merci beaucoup pour votre jolie feedback de votre vacances. On espère de vous revoir! Nous avions quelqu'un en fauteuil roulant , mais capable de tenir debout et de faire quelques pas, la maison ne lui a pas posé de problème. Privileged in being totally secluded, quiet and spacious with far reaching countryside views yet only minutes away from the centre of Moncarapacho. This 3 bedroom villa is ideal for perfecting the holiday of your choice! Set within private grounds of 4000 m2 of mature fruit trees and planted beds with plenty of terrace space for soaking sun and relaxing in the shade all around the villa and beautiful pool. A cobbled drive leads through the front gates into a parking area and lead up to a unique pagoda with spectacular views over the orchards and fruit groves with the hilltops in the far distance. An outdoor barbeque and seating area allows for dining outside and uninterrupted days spent around the poolside. There is also a small roof terrace accessed by external stairs. Golf: There are excellent golf courses within 15 to 20 minutes drive from the accommodation, namely Benamor, Quinta da Ria and Quinta da Cima, Monte Rei. Transport is advisable for this location and we can organise car hire and bicycle hire with a local reputable company. We also can arrange for taxi transfers. There is a once-weekly maintenance visit including a linen change and the pool and gardens are attended to twice weekly. We provide beach towels. Guests will be met at the villa and will have a contact number in case assistance is required.